match up is to trim up!! scrappy quilt at my house. I don't think this quilt will be lonely AT ALL!! I'm shedding a tiny tear. My fourth child got his driver's license today. I know from experience I won't be seeing him much anymore. Gone are the nice conversations in the car. Gone are the LONG waits picking him up from practices. I hear about his day. and the early mornings to get him to study sessions at school. Gone are those wonderful talks about nothing. Gone is the awful music! using only "darks" and "lights". What is a dark and what is a light? fabric choices in ANY other way. I happen to have a lot of scraps. These scraps do not necessarily go together. Can I put them together anyway??? fabric selection might make this even BETTER!! I'm too lazy to go figure it out. I made a bunch with light center squares. Can you see how I substituted that green. I didn't have enough of every fabric. Isn't that what using scraps is all about??? and a bunch with dark center squares. two light 2"x 3 1/2" rectangles. That all turns into a 5" block! Do some with dark centers and some with light! Love that "piano key" border that pulls it all together. O.k. the tops are done. NOW....Only 5 quilts to quilt. To celebrate I made something. I chose a day when NO ONE would be home. And to eat the goodies of course. I'd been wanting to make some stuffed Jalapeno peppers. So.....I walked to the store to buy the few things that I would need. I had to give myself a pat on the back for that part! Jennifer Jo had my mouth watering here. She normally has my stomach growling! Here are the peppers before the 1 hour wait. What a nice treat for finishing those quilt tops! My eyes said I could eat the whole batch! I'm feeling some maternal pride today. but this is her first quilt!! I saw this one coming together. A quilt always begins with those trips to the shop. I got to sit on the sidelines and watch it all happening! I'm a proud "quilt mother" today! so this quilt isn't quite finished. But we can all see that she's SOooo close! 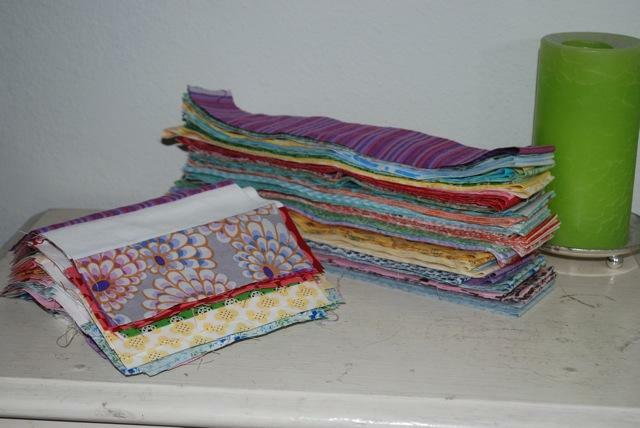 You've got to have two little quilts! Are you a "quilt mother" to anyone? I'm adding this to Amy's sew and tell! Today we're going to do a little math. Will that be too hard for you on a Monday? You know I've been working away on quilts for seniors. so today I'm going to document my progress. Pinned and ready to be quilted. From my quilt along with Victoria. I showed you this one recently. From the quiltalong with AmandaJean. How many quilts so far?? at the local art show. and I can't put it down!!! This is my liberated amish basket quilt. I've already begun quilting the third basket out of 16! I did not mark this quilt. I'm just following along with the piecing. 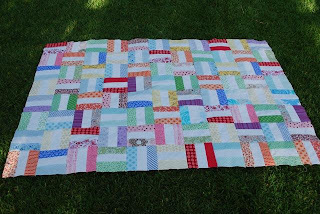 This big old fashioned quilt stitch goes fast!! Hobby Lobby when I was visiting my daughter. And I'm definitely enjoying myself as I quilt away!! But no idea how to execute it!! Do you ever have ideas? Sometimes they keep you awake at night. Ideas can also be exhilarating!! I know some things I won't do!! AND I know some things I want to Try!! so I guess I won't be doing this project for a while!!! headed to the local art show this weekend. I'm finishing this one JUST in the nick of time!!! This is the first quilt book I ever bought!! I met Gwen Marston here in this book about 3 years ago. and I bought this book! I read this book cover to cover many times!! I even made a couple of the quilts described. and lots of quilt shops!! You could say that Gwen is my "quilt hero"
Today I was able to take a class from Gwen! gave us a lovely "show and tell". The red border on the above quilt has the border. Someday I'm going to add one to a quilt!! A few of her small quilts. Most of them were hand quilted. I love the pot on this one! but don't match too perfectly! that it is NOT perfect. Here's a quilt with more modern fabric. with pots and flowers or leaves. I didn't get too far today. Then I did this tiny bit of reverse applique. It took me all day to do that???!!! OOps! Guess I was talking too much. last summer with Amanda Jean?!! These little guys finally are making an appearance. They may even end up in a quilt!??? You know the routine, right? And get it ready for the binding. One of these days I'm going to get them all done!! I thought I'd show you this. Aren't those little tiny blooms pretty?? This little cactus has been with me a long time. I sure had fun with these two blocks!! Can I have a quilt with a whole bunch of these?? who was inspired by Gwen Marston! guess what I thought about the whole time? I dreamed about that quilt class..
the REAL thing for me!! GREEN I put in there. I kind of like that little bit of green! And newspaper to paper piece these blocks. Do you know how hard that was for me??? I'm sending these to Sarah. and I just couldn't do it!! But, I'm sending them back. She'll fix 'em up...I'm sure!! Who knows how she'll work her magic??? I have a little pile of vintage sheets at my house. Hinting they'd like some company. the vintage sheet patchwork swap?? "I do like to shop at thrift stores. be turned into a quilt out there!" I found more than one. In fact, I had to leave some of the pretty sheets there. Then I need to send them off!! I'll get my mind OFF of vintage sheets!! I just l-o-v-e little things like this!